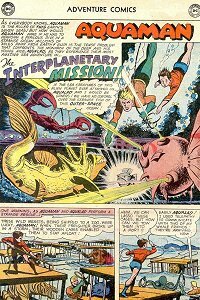 Adventure #275 (Aug 1960) - The Interplanetary Mission! Aliens request Aquaman's help in retrieving a lost satellite under their ocean. Captured/Knocked Out report: Aquaman and Aqualad are knocked unconscious during lift-off. Quotefile: Aquaman, attacking the aliens, "Okay! Now the fun really begins!" Finny Friends Report: Topo helps Aquaman and Aqualad corral floating cages with the wild animals in them. Two whales tow the cages to the nearest port. Topo joins the fight agains the aliens, and whales threaten their spaceship. While I don't like space stories, this isn't exactly your normal space story for the DCU. The aliens have an ulterior motive that Aquaman foils nicely, helping out Superman in the process. And Aquaman once again uses his brains to figure out the situation, although he seems to really enjoy the fighting once it starts. Just curious. Is there ever any mention of Aquaman on the cover and does the story usually end up as the final tale of the comic? Aquaman is almost never mentioned on the cover, but at this point in time neither are any of the other second features. Aquaman is often the final tale, but it isn't set in stone. We're getting really close to a change in Aquaman's status. Just a few more months and Aquaman gets his first solo cover appearance.